JOHANNESBURG, March 9, 2017 /PRNewswire/ — DHL Global Forwarding, the leading international provider of air, sea and road freight services, has been voted Africa’s International Freight Forwarder of the Year for the fourth time by readers of STAT Times, a leading international air freight publication. 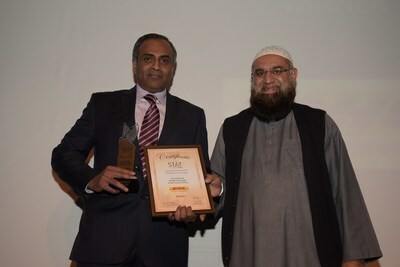 DHL was presented the International Award for Excellence in Air Cargo at a STAT Times ceremony on 22 February in Johannesburg. 2016 saw DHL deploy a range of new services to manage rising air cargo demand from Africa’s high-growth industries such as consumer electronics and mining, often with support from the company’s equally extensive portfolio of ocean freight services. The latest DHL Global Connectedness Index, which measures the flows of international trade, capital, information, and people between different countries, found that African nations remain some of the least-connected in the world, particularly those in Sub-Saharan Africa. DHL has invested steadily in infrastructure to boost Africa’s trade connectivity in recent years, including the construction of a EUR16 million freight hub of 17,500 sqm in South Africa in 2015.